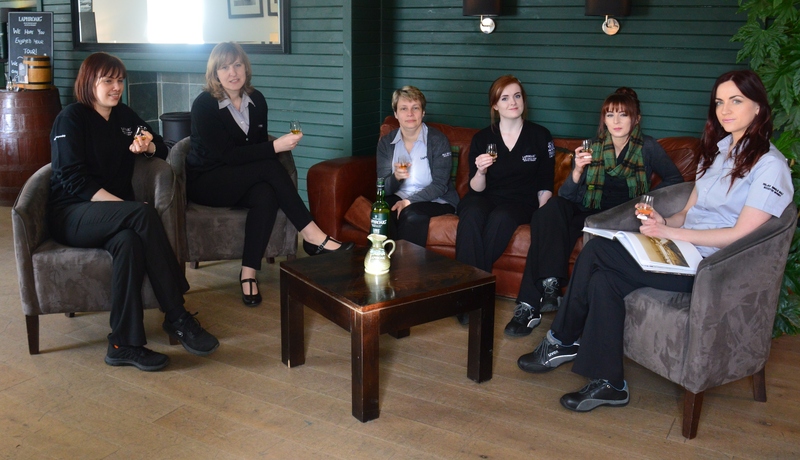 What do you think about women in whisky? EB – There are many more women compared to when I started 11 years ago. The women used to be passive and come along with someone, now THEY are drinking. DMK- Lots more women working in distilleries. CM – Yes, when I started in 1990 there was just me! CMG – Women are seen in the VC when the visitors come in. Women are being reflected back to themselves. Whisky is not seen as a man’s drink, now. VS – My inspiration comes from a wide range of people. DMK – Yes, like Bessie! SJ – My Gran inspires me. She encouraged George (Campbell, Balvenie) & me to stick in! CMG – My family. My family who have worked in this industry. CM -Yes, and the community ties here. DMK – My Granny, May McKerrell, the last Excise person. What is your favourite thing about whisky? VS – It brings people together. DMK- It creates friendship, chatting to each other on tour makes friendship. 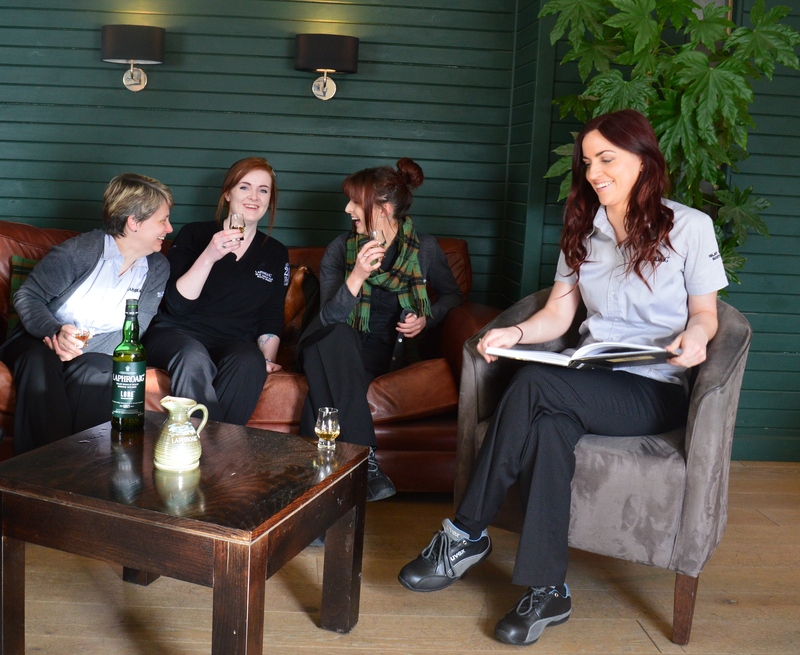 What is your favourite place in the distillery? CM- Top of the steps (going into reception) looking out into the bay. EB- The viewing area, where you can see the sign. CMG- In the still house when the foreshots are coming through, and it smells like banana, and it’s cold outside. It’s so cosy in winter! What is your favourite thing about the process? VS- The traditional way we do maltings, how it starts, nice to go into and smell the barley as it’s germinating. CMG- Maturation, the warehouse. All the smells, all casks starting as the same, then, will the spirit come out happy or grumpy?! CM- When it is only yourself in the warehouse. VS- Yes, you can be the first person to drink from a cask! There is “a feeling” in the warehouse.. the dust… it’s so special. What do you look for in a whisky? CMG- Strong, powerful, angry whisky! Where is your ideal place to drink whisky? EB- In the bath! Freezing cold outside, jump in, all the samples to try in a row along the side! CM- At Christmas time, around the Christmas tree. VS- Outside, take a dram at the watersource. SJ -Around your kitchen table. What’s the most important thing about whisky? CM – How it’s made and who makes it. VS- The heritage. Scotland is so proud. Advice for all women out there? CMG -You will find one (a whisky) eventually! – Keep practising. EB – It does NOT put hairs on your chest!! VS – Enjoy it, don’t worry about it. CM – To infinity and beyond! The world is your oyster. VS – A knitting show on Friday…. Thanks to the Powerful Laphroaig Ladies for your invigorating, inspirational interview.